We are now less than three weeks away from the 2018 trade deadline, and the rumors are starting to be more frequent and more serious sounding. As such, we’ve already discussed the merits of the Yankees trading Miguel Andujar and trading Clint Frazier. I don’t want them to trade either! But the Yankees have to consider all options as they trade to win the 2018 World Series. 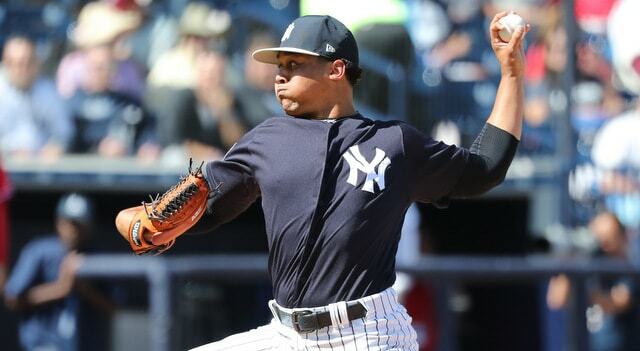 The final entry into this week’s spur of the moment “three reasons he should be available” series: Justus Sheffield, the Yankees’ top prospect now that Andujar and Gleyber Torres have graduated to the big leagues. The just turned 22-year-old southpaw has been excellent this season, pitching to a 2.44 ERA (2.92 FIP) with a 27.4% strikeout rate in 85 innings split between Double-A and Triple-A. He’ll represent the Yankees at the Futures Game next week. I am of the belief that, if he isn’t traded, Sheffield will help the Yankees this season in some capacity. Either as a starter or reliever. His role is going to depend on the team’s needs more than anything. Quality left-handed pitching is a necessity in Yankee Stadium and it stands to reason the Yankees should hold on to Sheffield and incorporate him into the rotation next year. Trading him can’t be off the table though, for three reasons. In fact, we might even be able to call them control issues, not command issues. Control is the ability to throw strikes. Command is the ability to throw quality strikes (on the corners, at the knees, etc.). So far this season Sheffield has an 11.0% walk rate and while that is a touch high relative to his career norms, it’s not wildly out of line with what he’s done the last few years. Both MLB.com and Baseball America (subs. req’d) gave Sheffield a future 50 grade for his command on the 20-80 scouting scale, which is average. That’s average command at some point in the future. Sheffield has nasty, nasty stuff. Lefties who sit mid-90s and have a wipeout slider are no joke. But there is work to be done to improve his strike-throwing ability and that’s not easy. The Yankees could decide to cash in on Sheffield’s potential as a trade chip and let some other team figure out how to improve his command. Does Sheffield’s peak line up with the rest of the roster? It is so unbelievably hard to win in baseball these days. You can’t just have the best lineup or the best rotation anymore. You need the best players — that includes the full 40-man roster — and you need to keep them healthy and on the field as often as possible, and use them in the right way (platoons, etc.). And you need as many of them in their prime as possible. Look at the last few World Series teams. The Astros, Dodgers, Cubs, Indians … their core players were all in their prime years. That’s what it takes to win the World Series these days. Have as many great players in their primes as possible, use them properly, and figure out a way to keep them on the field. Easy! Yeah, right. Lining up peak years is not easy. Look at the Yankees right now. Aaron Judge, Giancarlo Stanton, Aaron Hicks, Luis Severino, Aroldis Chapman, Chad Green, and Didi Gregorius are right smack in the middle of what should be the best years of their careers. The Sonny Gray trade hasn’t worked out, but that was part of the thinking behind the trade. He’s a prime age player. Sheffield is a 22-year-old kid who, as good as he is, may not line up with the big league team’s timetable. Judge, Stanton, et al are all ready to win right now. Sheffield has yet to make his MLB debut, and once he does make his MLB debut, he may have to go through some growing pains. What if he debuts this year, pitches well, then goes through a 2016 Severino year in 2019? It happens. Baseball is hard. Sometimes it takes players a while to find their footing. The Yankees aren’t going to give Sheffield away. There has been some Sheffield for J.A. Happ on social media chatter and that is crazypants. Not happening. If the Yankees trade Sheffield, it should be for an impact pitcher they can control beyond this season. A Jacob deGrom type, basically. And that’s the type of pitcher who best fits the Yankees and gives them the best chance to win this year. A star in his prime. Sheffield should be available for that type of pitcher. An unfortunate baseball truth. Pitchers get hurt, even the big strong ones with picture perfect mechanics. Sheffield himself missed time with a shoulder issue earlier this year, and last season which missed two months with an oblique injury, though at least that wasn’t his arm. Point is, Sheffield had a shoulder scare earlier this season, and he’s not the biggest guy at 6-foot-0 and 200 lbs. Durability may be an issue long-term. Now, here’s the thing: Veteran pitchers get hurt too. Edinson Volquez and Michael Pineda needed Tommy John surgery last year, for example. Yu Darvish has been out close to two months with a triceps problem. David Price missed most of last season with elbow woes. Stephen Strasburg visits the disabled list once or twice a year. So does Clayton Kershaw nowadays. Veterans get hurt just as much as prospects, if not more. Trade Sheffield for a veteran, even a stud like deGrom, and that veteran could get hurt tomorrow. That’s just baseball. In that case though, the Yankees would at least be acquiring a pitcher they can plug right into their MLB rotation with a reasonable expectation of success. If he gets hurt, he gets hurt. What can you do? Sheffield is in Triple-A. He might not be able to help you right away and that same injury risk is present. There’s an opportunity cost here. Trade Sheffield for big league help, or run the risk that he gets hurt and doesn’t help at any point. Just to make this perfectly clear, I am not arguing the Yankees should trade Sheffield. He’s awesome and I hope they keep him. I’m just laying out some reasons the Yankees could make him available, because his name will be — and already has been — tossed around in trade rumors these next few weeks. As good as he is, Sheffield’s control needs to improve, and by time he is reaches his peak, the rest of the roster might be past theirs. Plus there’s the injury risk. Trade him before he gets hurt and gives you nothing. That sort of thing. The Yankees will need to get a quality MLB player back in any Sheffield deal. And if that player is available, Sheffield should not be untouchable.